The Pathfinders class started with just 10 members 40 years ago, but the class currently has between 35 and 45 attendees each week. LIMA — From 1:30 to 3 p.m. Saturday, the Pathfinders class will be celebrating its 40th year by having a reunion of sorts. Pathfinders, which is a ministry of Lima Baptist Temple, began with three people praying separately. Ron Neth, who worked with special need children in Japan had a vision for a Sunday school class for people who were developmentally disabled. Joe Perron and Monyeen Boyd both had children with special needs. The small group did not receive much encouragement at first, either from the congregation or area experts. The class started with 10 students and 17 teachers. They now run 35 to 45 on any given Sunday, with a staff of nine teachers plus two alternating van drivers. 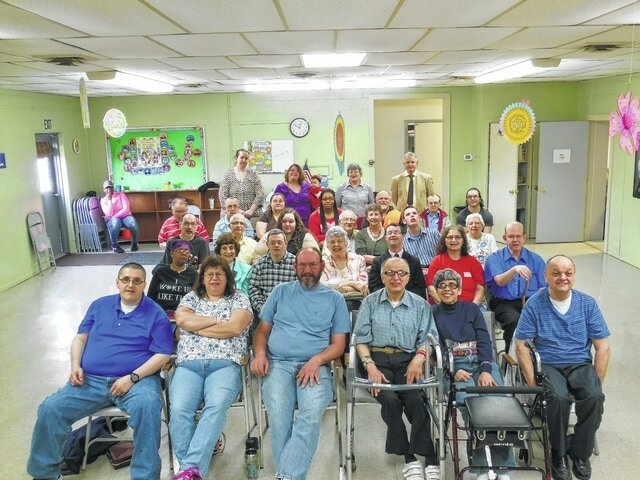 The class, which is unique in the Lima area, meets every Sunday morning at Lima Baptist Temple at 9:45 a.m. Refreshments like doughnuts and coffee are available as people come in, and the class time starts with singing and announcements, including recognizing anyone who has had a birthday. An offering is taken with various class members serving as ushers. Hanthorn said that they are currently using curriculum from Child Evangelist Fellowship which has a definite evangelistic emphasis. One of the challenges of teaching the class is that there is a wide range of abilities and issues. For example, some of the participants cannot read. “Most everything is written out,” said Boyd. “You have to keep remembering that some of them can’t read this, especially the older ones. Hanthorn said in recent years, one of the challenges has just been getting people to come consistently. Boyd said they have had a few members leave and then come back. Ultimately, Pathfinders is a place where those with developmental disabilities find acceptance, understanding and God’s love and truth.